You fail at something, your work is rejected, or you second-guess what once had value and suddenly you find yourself spiraling into a dark chasm of self-doubt. It starts with a critique of one project (“this is no good”), and before you know it, you question everything you ever created (“nothing I create is any good”). From there it’s a slippery slope into a dark hole of self-loathing (“I am no good”). It’s all about the stories we tell ourselves. When the self-doubt spiral takes hold, instead of reminding ourselves of the learning and successes that have emerged out of past failures, we dig up all of the stories that point to our overall lack of worth. Like carrying stones around in our backpack that weigh us down and keep us from completing our journey, we drag around a lot of old stories that no longer have any value. It started happening to me just last night. I’ve been trying to put the finishing touches on my memoir. I finished it a year and a half ago, but every time I try to do a final edit, something big changes and I end up feeling like there are still far too many loose ends. It’s been a great source of frustration, and I’m now at the point where I’m considering abandoning it all together and chalking it up to a meaningful process for my own value rather than a product I need to share. We ALL suffer from self-doubt now and then. When we’re in the spiral, we convince ourselves that everyone else has it easier, but that’s simply not true. The people you most admire all have self-doubt too. Their success is not because they never doubt themselves, but because they’ve learned to work through it rather than get stuck in it. What can you do when the self-doubt spiral threatens you? 1. Get into your body. The self-doubt spiral is the function of an over-active brain – a brain that is far too often driven by the ego. The ego’s job is to protect you from harm and to make you look good at all costs. Failure doesn’t sit well with the ego, so it will do whatever it can to convince you not to try again. Getting into your body (dance, run, walk, swim, etc.) helps the brain shut down the ego so that you can take a more honest look at where you’re at and focus on the stories that serve you better than those the ego keeps dragging up. 2. Go outside. Stand in front of a tree, lie in a field of grass, play in the snow, or dig in your garden. There’s something about being outside in nature that helps shut down the spiraling ego trap. Leaning on a tree that has been through the seasonal cycles of growth, harvest, and dormancy and then keeps showing up the next time Spring nudges it into growth, reminds us of our place in creation and our own strength to keep showing up the next time growth is required of us. 3. Help someone. Step away from the project that’s failing and go help someone else with their project for awhile. Or bring soup to a friend who’s sick. Showing up for other people helps shift us out of the self-centeredness of our failure stories. When you have a sense that we are all in this together and the community benefits from everyone’s best efforts, you’ll have renewed courage to carry on with offering the gifts that can benefit the world. Your community needs you and letting your own failure get in the way of that doesn’t serve anyone. 4. Develop simple rituals for halting the ego stories in their tracks. As the stories come up, write them on slips of paper and burn or bury them. Or write them on leaves and let them float down the river. Or create a shoebox home for your ego where the stories can be kept without getting in your way. You might even want to craft an ego creature out of clay and each time you sense your ego is trying to get in your way, have a conversation with it, or feed it your failure stories and then tuck it away while you go on with what needs to be done. Rituals help us find closure and they mark the passage into a new way of thinking. 1. Write down the stories that make up your spiral of self-doubt. 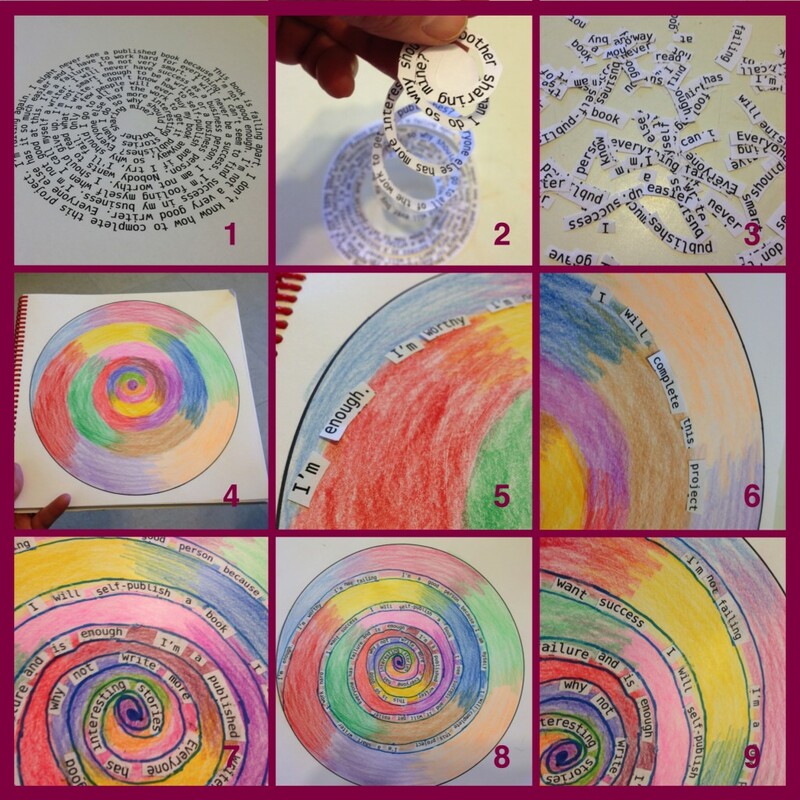 Write them in a spiral freehand, or use this online tool to reconfigure text into a spiral. 2. Cut the spiral. Enjoy the fact that it’s already looking prettier than those stories in your head. 5. Re-arrange the words into new stories – ones that uplift and delight you. 6-8. Keep going, arranging the words until you have a spiral of hope instead of a spiral of self-doubt. 9. Sit back and enjoy your new creation. And then carry on in your work, with hope and resilience instead of self-doubt and fear. They’re just stories. The words can be re-arranged to make new stories. Note: If you enjoyed this exercise, you can find 30 more like it at Mandala Discovery. Needed to read this today….thank you. Oh, Heather. I must’ve missed this last year, but I needed it this year. What a wonderful way to recycle our crappy stories and make them beautiful!